» Doubling up on valley trains — but when? Doubling up on valley trains — but when? 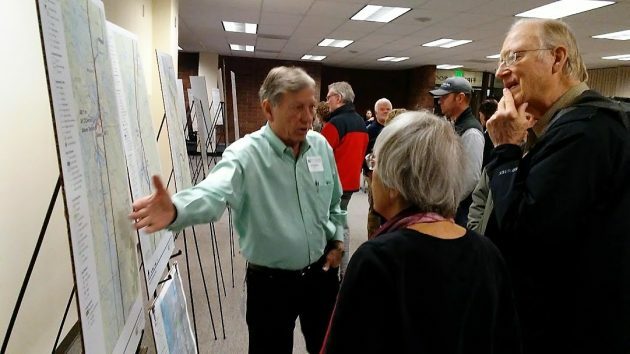 At Tuesday’s open house, ODOT rail planner Bob Melbo answers a question from Ron Green, right, and his wife, Tessa. Planners for Oregon Passenger Rail are aiming to double the number of round trips up and down the Willamette Valley, from three to six. That’s one of the details I was reminded of at an open house on the project Tuesday night. Another was about the timing of this project, which is to improve passenger rail service between Eugene and Portland, via Albany, Salem and Oregon City. The timing depends on a lot of imponderables, but the planners are talking about 2035. It will depend largely on whether, and when, the Feds give Oregon the money it will take to carry out the contemplated improvements. The draft environmental impact statement that was the subject of Tuesday’s Albany hearing compares two alternative routes. One follows the route the Amtrak Cascades trains and the Coast Starlight take now, on the Union Pacific main line. The other more or less follows Interstate 5. The freeway route allows for faster trains but would cost an estimated four times as much in capital costs, up to around $4 billion compared to about $1 billion for the existing route. State rail planner Bob Melbo, an Albany resident, said while the second alternative would follow the freeway, the track would not be built in the median between the north and southbound lanes. ODOT is reserving that space for additional travel lanes. So the track would have to be laid somewhere alongside the freeway. 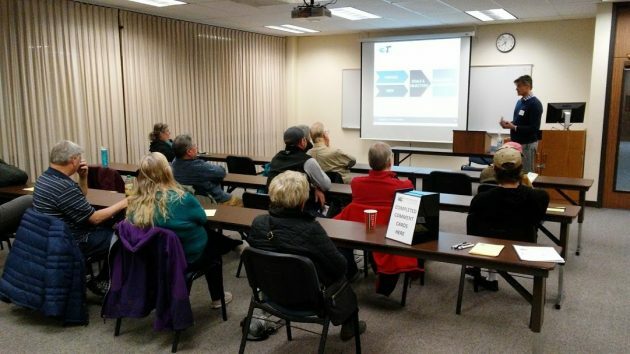 It’s probably a moot point, though, because a steering committee of Willamette Valley leaders, including Albany Mayor Sharon Konopa, has recommended that Alternative 1, the existing route, be adopted. Not many people showed up at the Albany hearing, at LBCC. I counted a dozen, and they were outnumbered by at least 14 people representing ODOT. The audience at ODOT’s Albany hearing on the Oregon Passenger Rail draft EIS. Native Oregonian Randal O’Toole just wrote a book with an interesting perspective on the history and economics of rail transportation. I know first hand that challenging the thinking of local politicians and bureaucrats is unwelcome in Albany. But given the billions of public dollars at risk, a 360 degree view of this topic is needed. Randal O’Toole is interesting. His take on railroad economics is the very least of my problems with him. If you consider only first-order costs and benefits, he’s probably right. If I ever get publicly and seriously involved with urbanism and transportation, I intend to study his writings to understand the opposition. Who knows, maybe he’ll convince me I’m wrong and that private cars are the only thing for America, because that’s what everyone wants (just like 16 oz. steaks and 40 oz. Cokes). He runs a wonderful railroad nostalgia (pre-Amtrak) site I just discovered, with lots of freely-downloadable postcards, ads, timetables, menus, etc. So we might have better rail service by 2035! Wow, I doubt that I will be alive then. So I can take that one out of my mind and not worry about it. Hard to believe that Europe has such wonderful trains, and we, in America, can’t seem to afford that. What is wrong with us? I guess we need to adopt the Jetson’s mode of travel because traffic is getting so bad. Makes one want to stay local.